Wow, #100 is here! When I started Freebie Friday 100 weeks ago, I had no idea it would go this far or bless this number of people. Amazing. This week we have two freebies: a download for everyone from Simply Youth Ministry, and a DVD curriculum set from YouthBytes. This is a $35 value that Simply Youth Ministry is giving away exclusively to Life In Student Ministry readers for 4 DAYS ONLY! This download link expires Monday, November 24, 2008, at 11:59 PM so get it now. 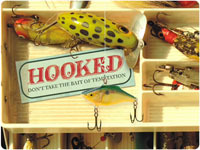 See more about Hooked, including a video review by Joshua Griffin, on it’s official page at Simply Youth Ministry. I’d appreciate it if you guys would post a link to this youth ministry resource giveaway on your blogs, message it to your friends in Facebook, spread it on Twitter, email to your ministry contacts, etc., so as many people as possible can be blessed by the curriculum giveaway from Simply YM for this short period of time. 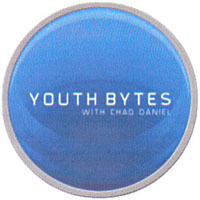 We use YouthBytes in my ministry on Sunday mornings with both jr. high and sr. high classes. Each video is very well done, has a lot of flexibility, communicates Biblical truth very clearly, and sparks great discussions among our teenagers. I highly recommend them! YouthBytes is giving away a 20 DVD set of video curriculum (40 episodes, $400 value) to one Life In Student Ministry reader. 1. What do you like best about Life In Student Ministry? How has it blessed your ministry? 2. A suggestion for how this site can improve in some way. How can it bless you even further? A new feature to add? Maybe a current feature that you don’t find particularly beneficial? Next Friday, November 28, 2008, I will randomly generate a number at random.org and count that many comments down from the top. That person will be the winner! (Must comment with a valid email address.) I’ll also post a comment below announcing the winner 7 days from today. Join our LIVE YM Talk today at 2:00 PM EST! We’re talking about if youth events are still working. Join us using either your telephone or your computer microphone!